Please note unless otherwise advised, slide boxes on this page accommodate standard 1 x 3 inch slides. Slide box essentials: correct size, tough and economical are first considerations. Special requirements may be plastic or metal hinges and clasp, particular colours, lightproof (for that chose a dark box and tape openings and wrap in aluminium foil). 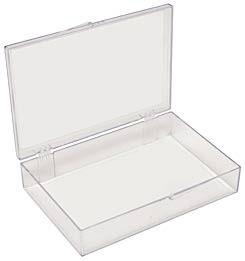 The most practical plastic for slide boxes is ABS (Acrylonitrile butadiene styrene ); it's very tough, it's brittleness point is ‐20°C and its usable to 70°C. These stackable boxes have a hinged lid. The clasp opens when the area under the catch is pressed. 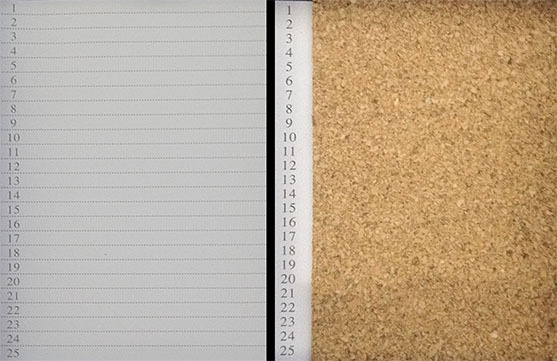 Slots are tapered down to 1.5mm, they are numbered, and have an index sheet. Cork base. External dimensions including protruding hinges (back) 82 x 53.5 x 32mm. Dimensions: 81 x 100 x 33mm. Dimensions: 199 x 95 x 33mm. Please note: Colours from manufacturer vary. Most likely your order would be supplied in one colour, but may not be the colour pictured. These stackable boxes have a hinged lid. The clasp opens when the bar to the left is pressed. 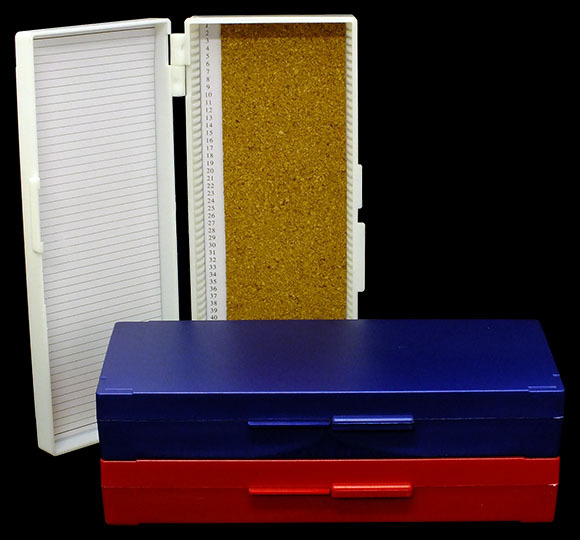 These stackable boxes have metal pins, a metal clasp, cork base, numbered slots and an index card. 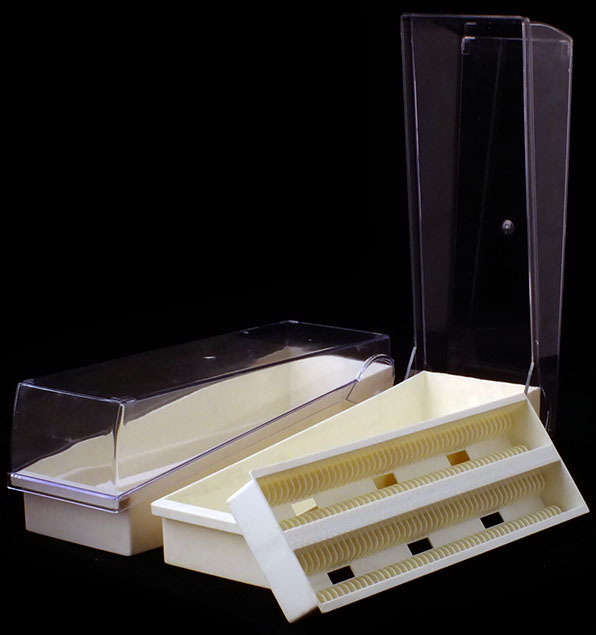 High quality slide box for standard size slides. Made from strong, white polystyrene, with proper hinges and metal pin, numbered on box and index sheet. Dimensions: 175 x 222 x 35mm, slots 1.93mm to fit 1 slide. Polycarbonate construction, this strongest of plastics makes for a most durable slide box. It has durable hinges and a stainless steel latch. The Cryo Compatible Slide Box, protects your 3" x 1" (75 x 25mm) slides in ultra-low temperature range. Polycarbonate's brittleness point is at -100°C, but these boxes may be used down to -195°C, except that below brittleness point they are less impact tolerant. 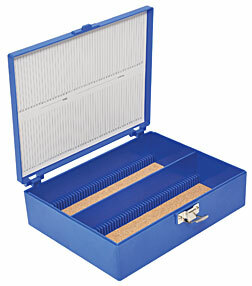 The slide box provides a 100-slide capacity with grooved slots to prevent slide to slide contact. The Cryo Compatible Slide Box offers a permanent identification sheet in the hinged lid, that corresponds to the numbering on the temperature-resistant foam lining in the base. These features provide ideal inventory maintenance ability. The boxes are stackable and can be autoclaved. 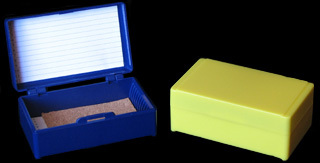 Slide storage box, made using strong ABS, with transparent, hinged cover. Best working temperatures for ABS is between -20 and &plus;80°C. The removable rack has 100 numbered slots for storing slides vertically. The 3mm slots allow backwards and forwards movement of slides for convenient viewing. Alternatively, each slot can accommodate 2 slides. Stackable. Best box for geologist's short slide for microanalyses, but also consider slide trays on page H1 for storing such slides. The most convenient, organised and versatile way of storing 75 x 25mm microscope slides vertically. This impact resistant SlideFile™ Storage System can hold up to 400 slides per unit in just 1720cm3 (105 cu. in.) and are stackable for space saving. 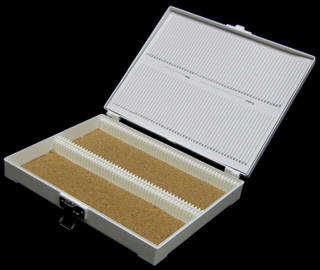 Each SlideFile System includes a slide box and two removable trays. A transparent hinged cover makes it easy to see at a glance the content of the box. For space saving purposes, you can double the number of slides simply by storing two slides side‐by‐side per slot. And for maximum storage space/long‐term storage,simply remove the SlideFile Tray and line up 400 slides in three rows. 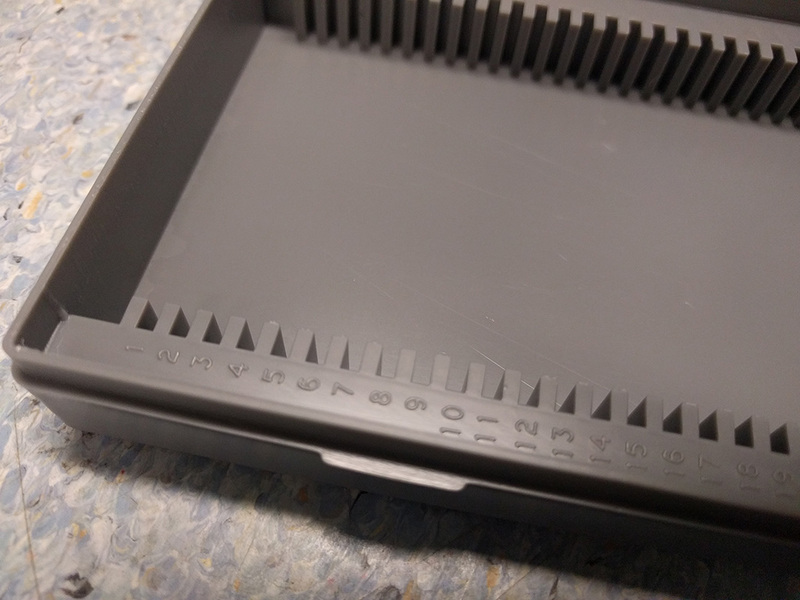 Six drain holes incorporated into the tray ensure complete emptying of the liquid when using the slide holder for drying purposes. Dimensions: 86 x 248 x 83mm high, slots 3.25mm wide. The SlideFile™ System is available in five colours: White, Blue, Green, Pink and Yellow. 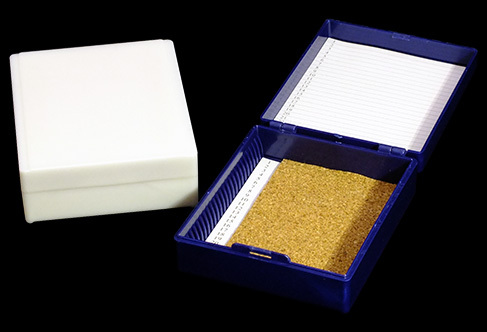 The tall slide box of sturdy ABS material is ideal for storage and transport of tall 75 x 50mm microscope slides. Available in a 100‐slide and 25‐slide capacity box with grooved slots to hold the slides securely in place and prevent slide to slide contact. The base contains location numbers for convenient inventory, a cork liner in the 100‐slide box and a foam liner in the 25‐slide box. 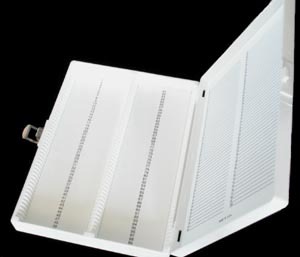 The tall slide box offers a hinged lid with a secure latch lock closure. 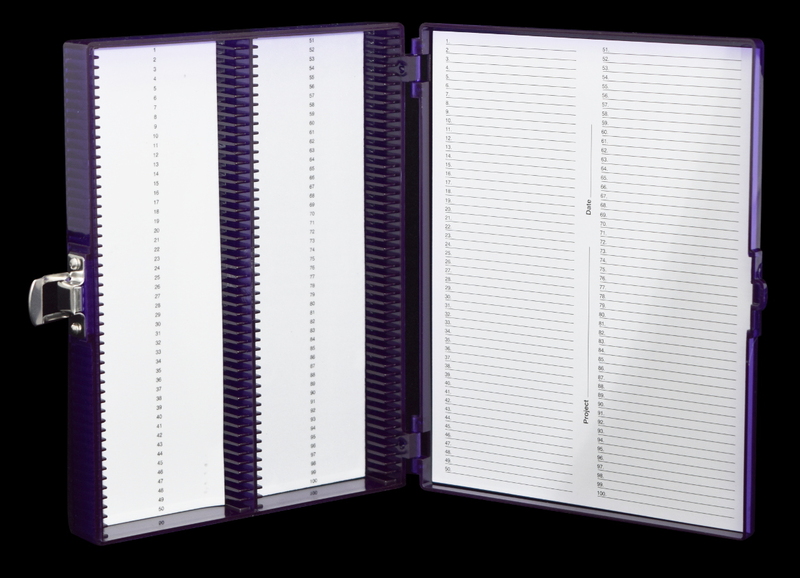 The lid interior contains a permanent inventory index sheet for cataloguing and identification. 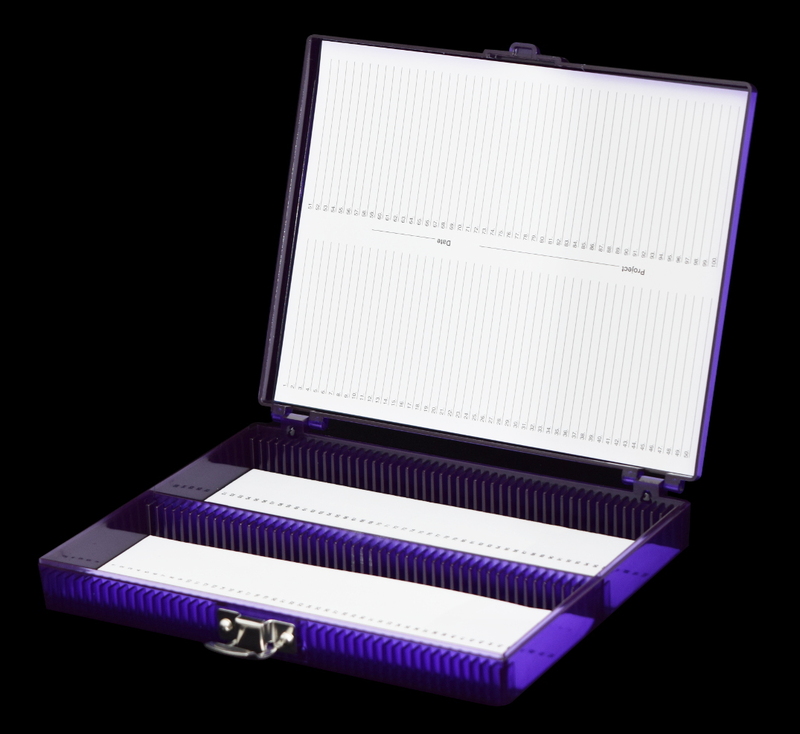 The deep design of the tall slide box provides safe storage for the taller, non‐standard microscope slides. 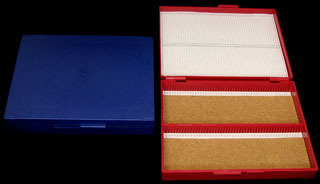 Other boxes for very large slides are available: 38 x 75mm; 101 x 75mm; 152 x 114mm; 101 x 126mm; 178 x 126mm ‐ inquire please. Store/ship/transfer delicate, sensitive articles between a soft, elastic double membrane. Plastic containers with thin membranes top and bottom. The PU membranes deform around the enclosed object and hold it securely. Small or large products may be held firmly within various box sizes (larger sizes are available ‐ inquire). May be used to store semiconductors, machine parts, electron microscopy parts or materials, and many other applications. H203 and H204‐X are hinged. 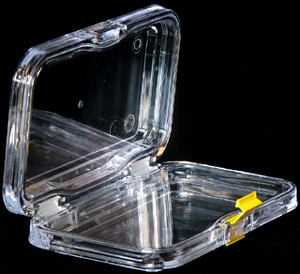 Box H203 is made of polypropylene which is not a clear plastic, but it has greater impact resistance than polystyrene. 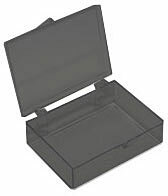 Membrane boxes now at greatly reduced prices. Best storage for very delicate specimens with good, all round visibility. 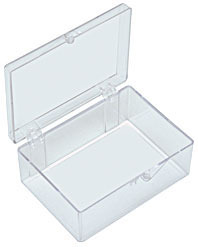 Strong, clear plastic boxes for storage and shipping. 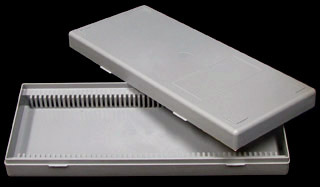 Single compartment, clear polystyrene boxes with hinges. 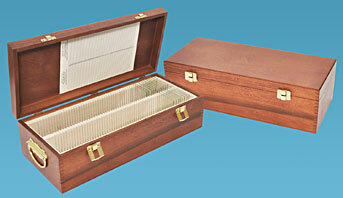 Useful storage for specimens, sample holders or small parts. These high quality wafer carrier trays are specifically designed for storage, transport and handling of semiconductor wafers, glass wafers or other delicate flat objects. Made from polypropylene material and available in sizes from 25mm to 150mm with maximum grip, minimum contact and minimum pressure. 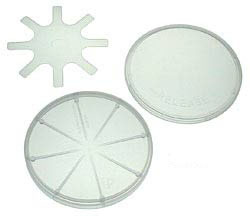 The wafer or disc carriers have a conical base to support the wafers at the edges only. The wafers are held in place and secured by a spider spring and locking cap. A telescope‐style box, square, made from white lined cardboard; edges are finished with white glossy paper. Centre portions of the top and bottom are not covered. Place your own identification in these spaces.